Clearly, Tom Scheerer and I are on the same page. Two posts this week that he is featured in. 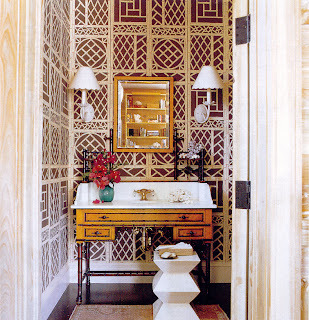 This trellis wallpaper from Quadrille is a dream come true. We all know I love all things chinoiserie, but this is different. It has this casual, country/island element to it. One day, when I am a real person who has wallpaper, I will put this up–and it will be fabulous. Really nice paper. I love wallpaper although I do not have any in my home. It is such a commitment I think, it is so much easier to paint a wall a different color when you tire of it. I adore wallcoverings and this one included. Wallpaper adds so much to an interior! Wow! I wouldn’t have thought it could look so great! Have the same WP on my radar!! After years of ignoring wallpapers I’m now obsessing over them!